'Square State' is to be divided into four Congressional districts. The southeast quadrant is urban and contains most of the population. The northwest is rural and the two remaining areas are suburban. You might answer that the logical way to divide the state is geographically with one rural district, one urban district and two suburban. Voting history shows the city inhabitants reliably vote blue, and the rural vote reliably red, with the two suburban districts containing the swing voters. (represented by blue and red dots) NOT. 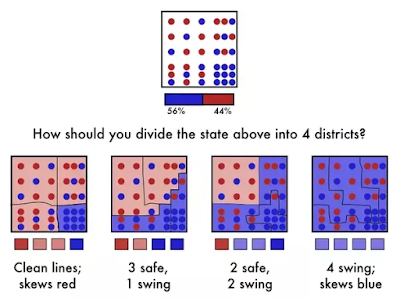 Gerrymandering is the art of drawing districts to suit those drawing the boundaries. Drawing boundaries based on geography produces the first smaller chart on the left. It skews the vote toward red. 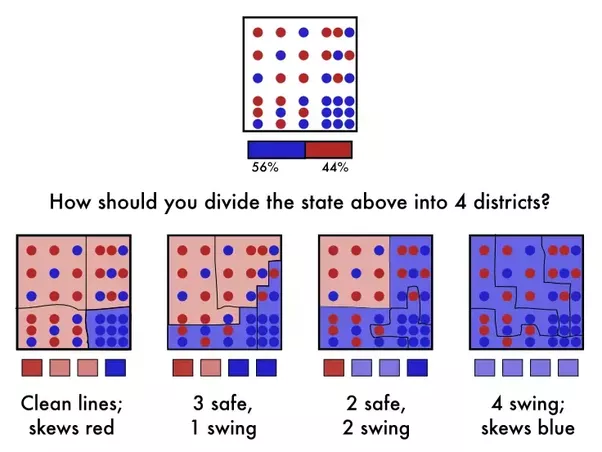 The last option with the snake-like boundary encompassing parts of all the quadrants produces four swing districts which skews the vote blue. This process explains why Congressional districts sometimes look like a missing piece of a jigsaw puzzle. It is done to insure "safe" districts. Who benefits from perversion of the process? The incumbent politicians of their respective parties. 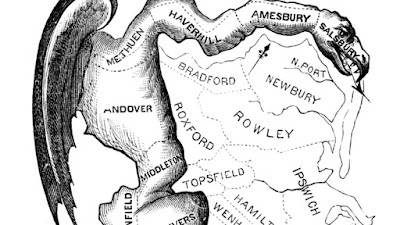 Below is a cartoon of the first ever gerrymandered district. The painter Gilbert Stuart was inspired by the bizarre shape of an electoral district on a map he saw in a newspaper editor’s office. He lampooned the snake-shaped district making it out to be some kind of antediluvian monster. “That will do for a salamander,” he said to the editor. “Gerrymander!”, replied the editor to Stuart. For the man responsible for the odd shape of that electoral district, in eastern Massachusetts, was Elbridge Gerry, governor of the state. Gerrymandering and money neatly explains this stark fact: Congress has an average 14% approval rating, but 95% of incumbents are re-elected!